■The throughput of SilverWriter 8850P KATANA is enhanced more than 60 ％ compared to that of the conventional machine. 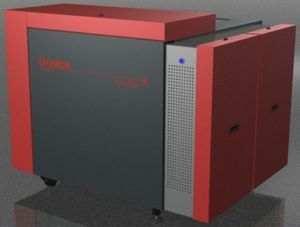 ■This machine equips three independent film-magazines which can put in 450 films and three kinds of size film to gain maximum flexibility of drawing. ■SilverWriter 8850P KATANA draws up high image quality based on user's severe design rule. If plot resolution is 25,400dpi (1μ), it's possible to draw up fine line such as minimum 12.7 μm. ■Two unique image formation functions which conflate a modulation and arrange a pixel with sub-micron eliminate a round error as the other company's product occurs and keep precision of line width with less than 2 μm. ■This machine equips an ultra-stable granite stage, linear motor with maintenance free, air bearing, new direct driving drum, so that, it promises more than reliability compared to the old machine (Silver Writer 8000).